In my experience painting and gaming, I have come to a few general conclusions about what colors are the hardest to master. Purple, Red, Grey, White and Yellow are generally considered the most difficult colors to work with at a more advanced level. In a few short minutes, you can learn the tecnhiques for color progression I have used to help earn me top honors in painting contests up to the national level. The focus will be on these more difficult to use colors, but general technique can be applied to any hue. These techniques are intended to be as easy as possible without sacrificing the smoothness of the progression. 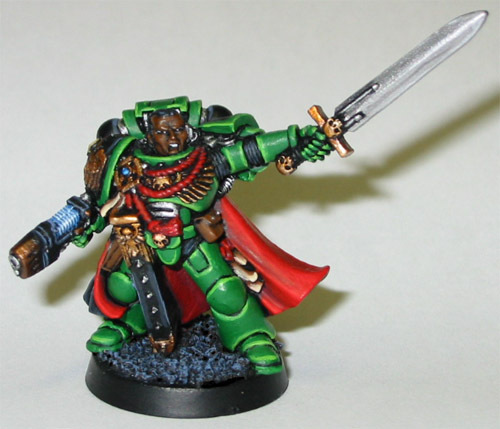 Before I begin, I will let you all know that all colors mentioned will be in Games Workshop's Citadel Color line. I find they have great quality and, more importantly, are readily available at most locations. I would also like to establish that these techniques do get a little complicated in parts, so are not always for the lower level painters. By all means you can take elements of these techniques and apply them to your work, but I would just like to let you know before hand that they may not work out perfectly on the first attempt if you don't have a good deal of prior experience. Purple is one of those colors you don't see very often, but when done properly the results are quite spectacular. 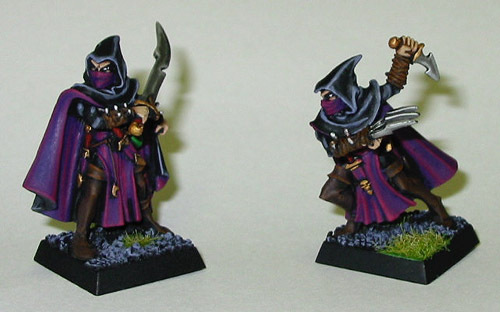 A good example of purple color progression is in my Dark Elf Assasins, seen below. There are only three colors you need to do this progression, namely Imperial Purple, Liche Purple, and Warlock Purple. There is no need to do the extremely dark Nauseating Blue or move into the pink spectrum of the Citadel Color line, or even into inks. The progression begins at a solid basecoat of Imperial Purple. Since you won't see much of this undercoat on the final model, you can usually get away with only one application. This is then hilighted with Liche Purple, leaving only the extreme folds Imperial Purple. There is a nice level of shading at this stage, so anything you want to leave a darker shade of purple than my example might not even have to go farther than this step. Once this is dried, I move on to a Liche/Warlock mixture. The Liche overpowers the Warlock Purple quite easily, so the first bright hilight is a 60/40 mixture of Warlock to Liche. This is applied, usually around 2mm thick, around the edges and tops of the folds of the cloth. It will usually take 2 coats of this mixture to cover over the darker purples. To compensate, you might want to slightly dilute the paint with water or paint extender to keep it from getting any lumps on the surface of the model. The final hilight is with pure Warlock Purple on the extremes of the folds. If you are lucky, the base color of Warlock/Liche will not show through the Warlock too much. Again, don't be surprised if you need a second application to get an even coverage. Next up will be Red. Red is symbolic of passion, anger, hatred, and vitality all in one. The use of such a powerfully symbolic color can invoke many emotions and feelings in someone looking at a model. Due to the lack of many shades of red in the Citadel Color line, many people struggle making a good progression with it. Scab Red is a very dark, shawody red; Red Gore is very similar to Scab, offering only a slightly lighter tone; and Blood Red is extremely bright and vibrant. There is little progression in between, so this requires more mixing of paint than most other color progressions. The only good example of red blending I have in digital format right now is in the inside of the cloak on my Salamanders Captain, which you can see below. The basecoat for red is Scab Red. This is a strong color, so can usually cover over black primer well in a single application. Most of the time I will do a second layer to be on the safe side, however. The first hilight over this is a 75/25 mixture of Scab to Blood Red. The reason for doing this is simple, Red Gore is a waste of time and money when you are interested in a bright red. The only use for Red is to soften the edges of Scab on a very dark red part of a model. The first Scab/Blood mixture is applied to everything but the darkest shadows of the surface. The next hilight is a much brighter one, flipping the ratio of Scab to Blood Red to 25/75. This layer makes up the majority of the red area, so leave only a small band of the darker mixture showing underneath this one. As before, this hilight stage may require a second layer, so think ahead and do two thin coats to preserve detail. The final hilight is a pure Blood Red line, usually just on the edges of the section. An alternate way of progressing through reds is to often start at a lighter shade, work up to Blood Red, and then move into oranges or occasionally even yellows. Bobby Wong's Bloodquest miniatures, seen below, are a wonderful example of this. However, straying from the original red tone is not my cup of tea, so I don't employ this technique myself. In the end, it is all up to you what technique to use. White, which is often reffered to as "The bane of my painting existance", is perhaps the most difficult color of all to do well. The overall appeal of the white section relies entirely on the purity of the white. Any mistakes, lumps, or other imperfections will show up more quickly on white than any other color. As such, white is often used as a compliment to other color schemes, rather than as a base in itself. There are many ways to actually go about painting white on a model. Perhaps the easiest is to just start with an application of white primer, followed by a dilute blue or grey ink. To make a more linen color, use a very dilute brown or beige wash. Either technique is followed up with another application of white around the raised surfaces of the model. Personally, I choose to start with a light grey and work my way up to pure white. This takes a bit more time, but with careful selection of which paints to use, you can cut most of this time away. Make no mistake though, it is still the most time consuming transition to attempt on a model. I begin with a 40/60 mixture of Shadow and Space Wolves Grey. This leaves a relatively dark shade, but is not too dark to work with in the latter stages of hilighting. This is followed up by usually two thin coats of Space Wolves Grey, leaving only the darkest crevases of exposed Shadow/Space Wolves Grey mixture. From here, the best paint to progress to is Ghostly Grey. It is very close to Space Wolves Grey, being only slightly lighter. Again, two thin applications usually do the trick. The next layer forms the main color of the white, and as such should be applied to the majority of the surface you are painting white. Skull White and Ghostly Grey are mixed in an even 50/50 ratio, giving an almost pure white with a tinge of blue-grey. Two thin applications are reccomended for pure, clean coverage. The final hilight stage is a pure Skull White, which is applied sparingly to the edges and/or tops of the folds in cloth. Try to stay away from covering the entire raised portion of the model with pure White, as it looks less like a hilight and brings out any flaws more than is necessary. Instead, use it as a standard final hilight, only applying it to the extremes of the surface. Again I must rely on the work of Bobby Wong to show off the technique I described above. He might have used a slightly different technique, but the effect achieved was the same. 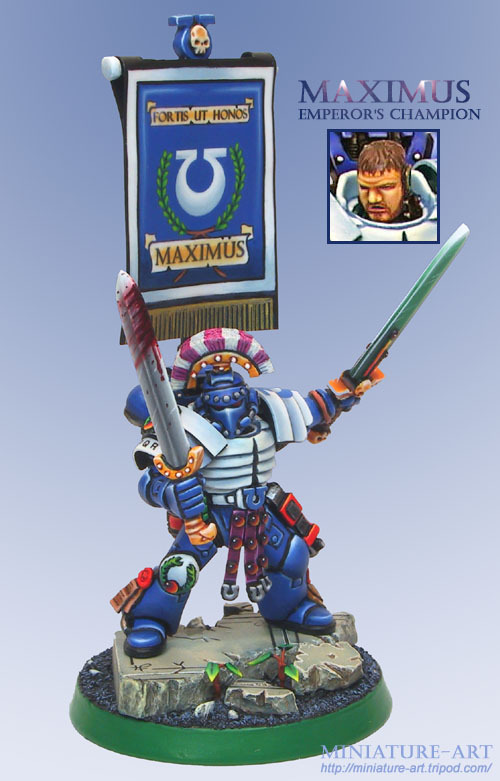 The white areas of his impressive Ultramarines Emperor's Champion model look almost exactly the same as a model painted with the above technique would look like. Grey is another color that many have a hard time mastering. As far as I can tell, this is due to the fact that grey is the most neutral color in the spectrum. As such, you have a very good mental perception of what a good grey transition should look like. Also, it is very difficult to make a strong transition in grey without ruining the subtlety of the color. 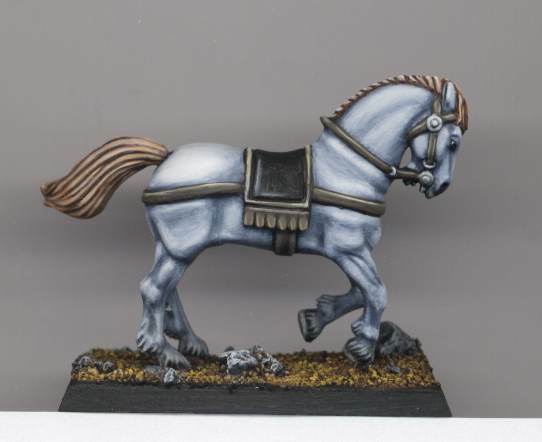 These subconscious expectations often lead to a well painted grey model being underappreciated. 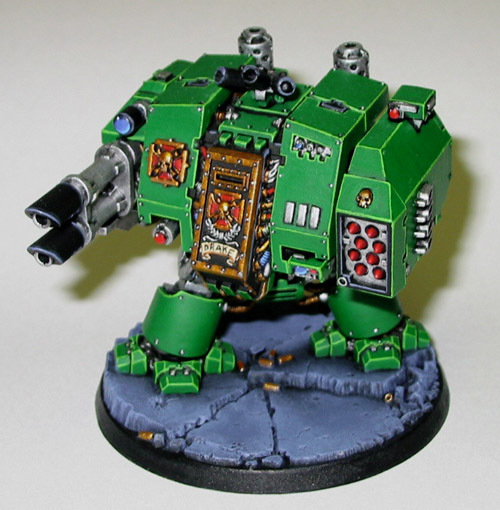 A good example of subtle, yet effective use of grey on a model is in the base of my Salamanders Dreadnought. The hilights are blended well, so the transition is very smooth and the subtlety is maintained. The base color I use when working with greys is usually Shadow Grey with a hint of Chaos Black mixed in. This can usually be applied to the entirety of the model, save the darkest and most extreme cracks (ie. 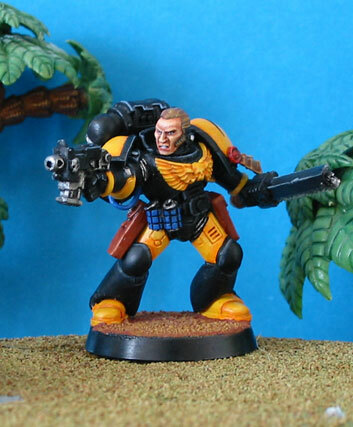 the seams of power armor on a Space Marine), which may be left as the black undercoat. From there, you can move straight to pure Shadow Grey with ease. This hilight is applied to nearly the entire surface of the model, as it is a very good medium grey. The next hilight I use is a 50/50 mix of Shadow and Ghostly Grey. This is applied in a very smooth fashion to the raised surfaces of the model. When hilighting grey, it is often beneficial to use smooth and curved hilights rather than following any straight lines on the model perfectly. This comes back to the natural, organic look of the transition. If a lighter grey is desired, all you need to do is add a greater proportion of Ghostly Grey to the mixture, and follow the same basic hints above. A second great example of blending in this manner is the horse model submitted by Markus Mohr. I don't know too much about his technique, as he is German and speaks little English, but it appears to be the same as mine taken up to brighter hilights. This is a good example of hilighting where it looks natural more than just following the curves of the model. Another technique that works very well when working with flat pieces of grey rock or cement is stippling. If you haven't heard of stippling, it is essentially drubrushing but instead of dragging the brush across the surface, you dab it into the model where the hilight should go. Stippling was used to help blend the colors on the Dreadnought base I showed you earlier. 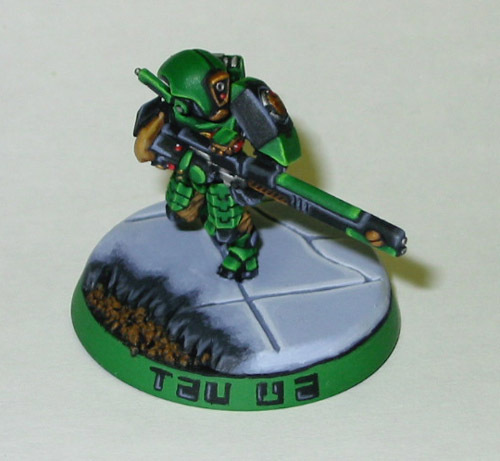 Yet another example of stippling is in the charred edge of the base on my Tau painting contest entry that took 4th place at NewWave. The base was hilighted through Shadow to Ghostly Grey, using smooth lines even on a square pattern floor tile. The charred effect was made by blending from black to dark grey in a rough manner, followed by stippling of the intermediate color, followed by stippling with a color very close to the base of the floor color. Any distinct edges can be hilighted over the stippled layer, as you can see in the tips of the broken tiles. This combination of techniques is hard to describe, but as you can see works well when enough time is taken to master it. Finally, I come to yellow. This technique is not something I do very often, so most of the advice in this section will be either hypothetical or based on the proven techniques of people I know and game with. 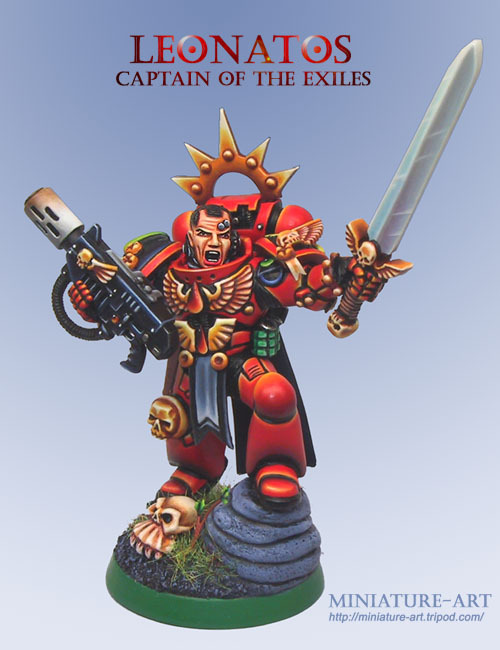 The example I will be using as a diagram is from Sabastian Stuart's website, The Scythes of the Emperor. His models are a great example of a rich, golden yellow. This can be achieved easily when taking advantage of inks. The basecoat of the model can either be done in Golden Yellow or Vomit Brown, depending on the purity of yellow you are looking for. Golden Yellow will be more pure, and Vomit Brown will be better for dark, golden yellow colors. This should be followed up with a Chestnut Ink wash, diluted to taste of course. Once this base layer has been established, it is a good idea to restore the original color. In either case, Golden Yellow is applied to all but the dark recesses of the model. If this step is skipped, it makes the transition less smooth, so I would reccomend it in all cases. From here, all that is necessary is to work up through the Citadel yellows; from Sunburst/Golden Yellow mixtures, to pure Sunburst, and finally to Badmoon. If you want a dull Yellow color, Bleached Bone can be added to the hilight stages. If a richer, darker yellow is desired, like the one pictured above in the Scythe of the Emperor, a glaze is a good way to achieve this. Yellow Ink with a hint of Orange Ink will bring out the colors beautifully when diluted a lot and applied as a glaze. This a a great last step as it really brings the colors together nicely as well as darkening them. Well, there you have it. These techniques can help you blend your way through some of the most difficult colors in modelling. If you have any questions, post them and I will do my best to answer them or, where applicable, edit them back into the original article for easier reference.